The 16-64 Knicks have locked up the NBA’s worst record, which translates to a 14 percent chance at Zion Williamson and the assurance that their pick will not fall outside the top five. Insofar as the team could be said to have any goals this season, they have now all been achieved: offload unhappy star, clear out cap space for a disappointing free agency, maximize chances at drafting sequoia-shaped unhappy star of the future. Check, check, check! Now there’s just the pesky business of putting players on the floor for those remaining “games” on the calendar. If leaving an unmanned controller on the sofa was an option, they would have taken it. The roster is rotted through at every position (except one), and thinning out most dangerously at point guard, which they’ve patched over with sad lottery picks. Last year’s pick Frank Ntilikina has struggled with lower-body injury and atrocious offense. Even when he was healthy, coach David Fizdale kept him buried behind Emmanuel Mudiay, who is bad, and now benched with shoulder and hamstring injuries. Dennis Smith Jr., acquired in the Kristaps Porzingis trade and looking decent, has been playing through a back injury. This mess cleared a path for an intriguing new starter at point guard: one 6-foot-8 Mario Hezonja. To characterize Mario Hezonja on the floor through the first six months of this season: What if the most athletic dude trying to assassinate Franz Ferdinand fell through a wormhole, landed in an NBA lineup, and had to figure it out? To characterize Mario Hezonja on the floor in April: What if a guy with solid size, bounce, and handles finally got to take the reins of a hopeless team, playing his favorite position? The results may surprise you. 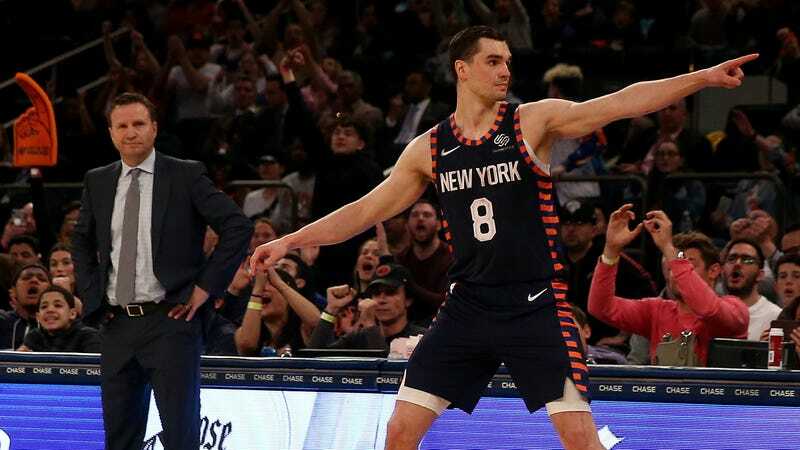 Hezonja, typically slotted on the wing, took on primary ball-handling duties Sunday night and and lit up the (also tanking) Wizards for a career-high 30 points, plus six boards and five dimes. A game before that one, Hezonja had 29 points, nine rebounds, and five assists in a loss to the Magic, the team that drafted him in the 2015 lottery, then let him walk instead of picking up the last year of his rookie deal. If they knew what he was capable of in this playmaking role, maybe they would have held onto him, but they have Markelle Fultz for that now, so they probably don’t have any regrets. It seemed like the only recognizable moments of this Mario Hezonja season would be posterizing the new best player in the NBA, and smothering the old best player in the NBA, a surreal pair of highlights in a sea of turnovers, hair gel, and grimaces. And maybe they will still comprise Hezonja’s final NBA statement. But he has two more games to buy himself some more time, a duel with the putrid Bulls and a season finale against the playoff-desperate Pistons. Perhaps there’s another triple-double in him, or another 30-piece. Surely some team out there will roll the dice on a guy who can kinda get to the rim and can’t really stay in front of anyone and still might ultimately be one of the most damaging players at his position. Typically that’d be the Knicks cue to write up a contract, but, alas—this time they’ll be the ones cutting him loose.